As you may have heard, Donald Trump has gone after Marco Rubio on his personal finances (e.g., the Florida GOP credit card he apparently ran up while State House Speaker back in the day), and predictably, Rubio has responded by going after Trump for his companies’ four bankruptcies. So it’s a draw, right? Or perhaps Rubio comes out ahead, one might imagine, since (a) declaring bankruptcy is worse than abusing an expense account a bit, right? and (b) Trump started it! I dunno about that. Moderators and other candidates have been attacking Trump over the bankruptcies from the moment he announced, with no visible effects. It’s too early to determine if Rubio will be similarly immune from this sort of attack. 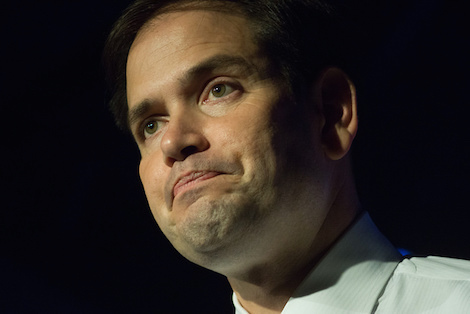 I have a theory for why this could be a bigger problem for Rubio than for Trump. Trump’s bankruptcies, as he keeps pointing out, weren’t personal, but were corporate, and thus part of the corporate shenanigans most regular folks dimly know about but don’t understand. Just about every middle-class person understands getting a business credit card and yielding to the temptation to whip it out to pay for an expensive personal item–planning, of course, to reimburse The Company bye and bye. They might forgive this behavior, but they also may not forget it, especially when the person in question (a) does something identified in the minds of many middle-class folk as unforgivably irresponsible, by dipping into the retirement account to pay off debts; and (b) gets out of the trap not by taking on a second job or cutting back on the lifestyle but by finding himself a rich sugar daddy. It’s just a theory, mind you, but I don’t think Rubio needs to get into this particular firefight. He could restore some of the trust that Barr has squandered.